IQ Stream Technologies is one of the top quality SAP HANA training institutes in Bangalore with highly experienced and skilled professional trainers delivering the courses. IQST offers SAP HANA courses S4, BI, BW, SAP Administration, Cloud Integration training, Simple Finance, Simple Logistics etc. 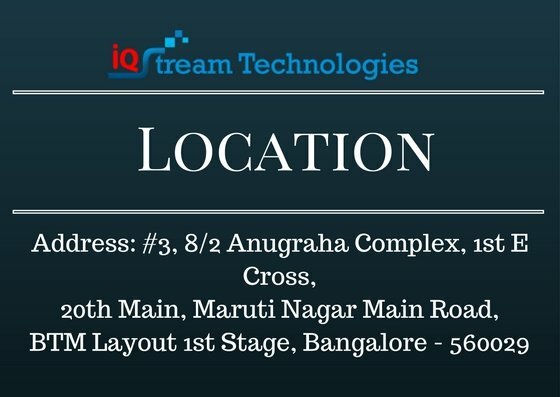 IQ Stream Technologies Bangalore also offers placements for students who enrolled in SAP HANA (high-performance analytic appliance) Courses. SAP HANA is an in-memory, column-oriented, relational database management system developed and marketed by SAP SE. Its primary function as a database server is to store and retrieve data as requested by the applications. We offer advanced SAP HANA training classes, advanced learning experiences and tools for better learning, understanding and experience. Our course content and syllabus are very advanced and updated and curated by highly experienced trainers. IQST is one of the authorized SAP HANA training centres in Bangalore with online training. What is a HANA database? SAP HANA is an in-memory, column-oriented, relational database management system developed and marketed by SAP SE. Its primary function as a database server is to store and retrieve data as requested by the applications. What does the acronym Hana stand for? What is the difference between SAP and HANA? The new SAP ERP solution is S/4HANA which is the grandchild (because before S/4HANA, R/3 was succeeded by SAP ERP) of R/3 that is written to run with HANA as its database. What is the cost of SAP HANA? Price varies depends on the Component, Price (512GB), Price (256GB) etc. Is HANA a Nosql database? NoSQL, OldSQL, NewSQL, In-Memory & SAP HANA. Is HANA a data warehouse? The most dominant licensing of choice is the SAP Hana Enterprise Edition. However, customers explicitly interested in running Business Warehouse on SAP Hana can license Hana in two ways. What is SAP HANA and how it works? SAP HANA Enterprise 1.0 is an in-memory computing appliance that combines SAP database software with pre-tuned server, storage, and networking hardware from one of several SAP hardware partners. What is the SAP HANA appliance? SAP HANA is a flexible, multipurpose, data-source-agonistic, in-memory appliance built on Intel(r), Xeon(r) processor 7500 series that combines SAP software components optimized on hardware provided, and delivered, by SAP's leading hardware partners, including Cisco. What is SAP HANA architecture? The main SAP HANA database management component is known as the index server, which contains the actual data stores and the engines for processing the data. What is a SAP HANA live? SAP HANA Live provides SAP-delivered content (similar in concept like SAP BW content), in form of SAP HANA calculation views for real-time operational reporting. This course is based on SAP HANA database for SAP ERP. The SAP HANA courses require that you understand the content of this basic course. • SAP HANA introduction with HANA artifacts with sample examples. • HANA artifact creation/ Debug/ Test/ Troubleshoot techniques. • Software development for HANA database. • ABAP development for SAP HANA. • Why to Choose SAP HANA? • When to Use Columnar Storage? And When to Use Row Storage? • Creation of database schemas and database tables. • Usage of SQL script debugger. • Creation and exposing OData services in HANA for UI5 interface.